05/08/16 -- Soycomplex: Soybeans and meal closed higher on the day but lower for the week. Informa released their latest US crop production and yield estimates, falling between the two stools of the USDA's July numbers and what FCStone gave us earlier in the week. They said production would be 3.958 billion bu with a national average yield of 47.7 bu/acre. The USDA currently line up at 3.88 billion bu and 46.7 bu/acre on yields. The USDA reported export sales of 498,000 MT of soybeans for delivery to China during the 2016/17 marketing year under the daily reporting system. That's over 2 MMT sold to China/unknown under the daily reporting system this week alone. It's looking like China is switching demand to the US earlier than usual. Brazil's July soybean exports were down 3 MMT versus July 2015 (and June was down 2 MMT). A larger than anticipated US crop is therefore going to be needed to supply this increased export demand. Aug 16 Soybeans settled at $10.03 3/4, up 13 1/4 cents; Nov 16 Soybeans settled at $9.74 1/2, up 17 3/4 cents; Aug 16 Soybean Meal settled at $335.80, up $6.10; Aug 16 Soybean Oil settled at 30.52, down 2 points. For the week Aug 16 beans were 28 3/4 cents lower, meal was down $14.60 and oil added 17 points. Corn: The corn market closed firmer on the day but lower for the week. Light consolidation is I guess what you could call today's action. The US harvest is drawing ever-nearer and much of the time for a corn threat is already behind us. Informa came out with a US corn production estimate of 14.694 billion bu on yields of 169.8 bu/acre. FCStone estimated 2016 US corn yields at 175 bu/acre and production at 15.146 billion bushels, both record levels. The USDA were at 168 bu/acre and 14.54 billion bu last month. The weekly commitment of traders report shows managed money short 104,434 contracts in corn futures and options as of Tuesday night. The Buenos Aires Grain Exchange said that the Argentine 2016 corn harvest is two thirds done at 19.1 MMT. Final production is seen at 28 MMT. FranceAgriMer raised French corn good to very good ratings by one point to 70% (58% a year ago). US July Corn exports totalled 240 million bushels, a record for the month. As with beans the US is seeing a switch in demand from South America earlier than usual. Brazil is now looking to import US corn to make up for a shortfall in it's own safrinha corn production and compensate for it's own early aggressive export pace. Sep 16 Corn settled at $3.24 1/4, up 3 1/2 cents; Dec 16 Corn settled at $3.34 1/4, up 3 1/4 cents. For the week Sep 16 corn was down 10 1/4 cents and Dec 16 fell 8 1/2 cents. 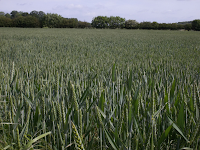 Wheat: The wheat market closed firmer on the day and the week. Magnitudes were varied across the exchanges. The French Farm Ministry lowered their 2016 yield estimate to 5.57 MT/ha, taking production down to 29.1 MMT. FranceAgriMer lowered good to very good ratings another 5 points today taking them down to 35% versus 77% a year ago. They now have 10% of the crop rated very poor and 28% poor, with 31% average. Harvesting is 62% complete. The Buenos Aires Grain Exchange has Argentine wheat plantings complete on 92% of the planned 4.3 million ha. Brussels reported the approval of 352 TMT worth of soft wheat export licences this past week (down from 413 TMT a week ago), taking the season to date total to 2.58 MMT so far (versus 2.0 MMT a year ago). France picked up 64 TMT worth of this week's export licences. The German wheat harvest is approaching halfway done. The UK wheat harvest is only just beginning. Both look certain to have lower production than last year, although things aren't as bad as they are in France. Sep 16 CBOT Wheat settled at $4.16, up 12 3/4 cents; Sep 16 KCBT Wheat settled at $4.11 3/4, up 6 cents; Dec 16 MGEX Wheat settled at $5.04 3/4, up 3 3/4 cents. Sep 16 CBOT wheat was up 8 1/4 cents on the week, KCBT wheat added 3 cents and MGEX was up 1 cent for the week. 05/08/16 -- EU grains closed mixed on the day and for the week. At the close Nov 16 London wheat was down GBP0.45/tonne at GBP127.00/tonne, Sep 16 Paris wheat was up EUR0.25/tonne to EUR166.50/tonne, Aug Paris corn was up EUR0.50/tonne at EUR165.00/tonne and Nov 16 Paris rapeseed was EUR2.00/tonne firmer at EUR366.25/tonne. For the week as a whole, London wheat managed net gains of GBP1.30/tonne, Paris wheat added half a euro, corn lost EUR3.25/tonne and rapeseed was up EUR4.25/tonne. French wheat crop conditions fell once again. This time FranceAgriMer dropped the proportion of the crop rated good to very good 5 percentage points to just 35% (77% a year ago). They now have 10% of the crop in the worst "very poor" category, along with a further 28% classed as "poor". They said that the French wheat harvest had advanced to 62% complete (41% last week and 82% this time last year). French corn ratings were up one point at 71% good to very good (versus 58% a year ago). The French Ag Minister said that he expects French soft wheat production to be down 29% at 29.1 MMT this year. The HGCA said that the UK winter barley harvest had reached 60% done, with yields averaging 5.9-6.3 MT/ha versus the recent norm of 6.8 MT/ha, a drop of 10% on last year using the mean decline. The winter OSR harvest is 40% complete with yields averaging 3.1-3.3 MT/ha versus 3.6 MT/ha for the recent average, an 11% drop on the mean. The winter wheat harvest has only just begun so it's too early to give an average yield estimate, but below average looks a safe bet. Using the HGCA's planted area estimate of 1.794 million ha a 7.5 MT/ha yield would give us a crop of 13.455 MMT, an 8.0 MT/ha yield returns a 14.352 MMT crop. Production last year was 16.44 MMT. On the export front, Brussels reported the approval of 352 TMT worth of soft wheat export licences this past week (down from 413 TMT a week ago), taking the season to date total to 2.58 MMT so far (versus 2.0 MMT a year ago). 04/08/16 -- Soycomplex: Beans closed around unchanged. Weekly export sales of 542,200 MT for 2015/16 and 1,128,200 MT for 2016/17 were supportive. In addition the USDA reported sales of 252,000 MT of soybeans for delivery to China during the 2016/17 marketing year under the daily reporting system. Exports of 718,800 MT were up 16 percent from the previous week and 81 percent from the prior 4-week average. China are said to be planning to attempt to auction off 600 TMT of state-owned soybean reserves on Friday. US weather is mixed, but nevertheless a record large crop seems to be on the way. How record large the USDA will tell us next week. FCStone said 4.054 billion bushels earlier in the week. Informa are expected to release their numbers tomorrow. A Bloomberg survey into trader/analyst sentiment found 8 soybean bulls, 13 bears and 11 neutrals. Aug 16 Soybeans settled at $9.90 1/2, unchanged; Nov 16 Soybeans settled at $9.56 3/4, up 1 1/4 cents; Aug 16 Soybean Meal settled at $329.70, down $0.80; Aug 16 Soybean Oil settled at 30.54, up 24 points. Corn: The market closed around 3-4 cents lower. The USDA reported 129,000 MT of corn for delivery to unknown destinations during the 2016/17 marketing year under the daily reporting system. Weekly export sales came in at 331,100 MT for 2015/16 and 896,300 MT for 2016/17. Exports were 1,138,500 MT were down 18 percent from the previous week and 11 percent from the prior 4-week average. In Brazil the Mato Grosso safrinha corn crop is 38% harvested and production is seen at only 6.2 MMT versus 9.1 MMT a year ago. Very low yields are being reported due to hot and dry conditions. 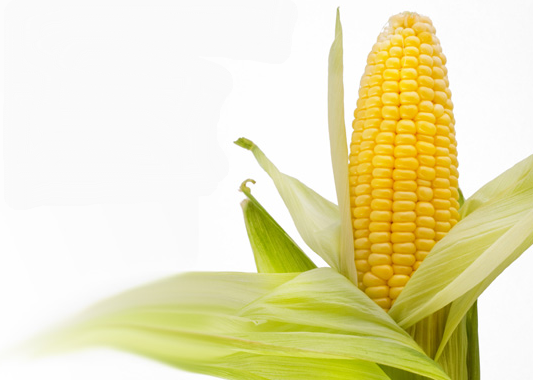 The shortage of availability of safrinha corn is such that the Brazilian government are said to have agreed to allow 1 MMT of duty free US corn imports for the livestock sector between now and the end of October. China were said to have sold only 143,500 MT of state-owned corn reserves at auction out of an attempted offering of 3.2 MMT. A Bloomberg survey into trader/analyst sentiment found 8 corn bulls, 11 bears and 13 neutrals. Sep 16 Corn settled at $3.20 3/4, down 4 1/4 cents; Dec 16 Corn settled at $3.31, down 4 cents. Wheat: The wheat market closed lower. Weekly export sales came in at only 326,500 MT for 2016/17 - down 36 percent from the previous week and 39 percent from the prior 4-week average. For 2017/18, net sales of 44,000 MT were reported for Nigeria. Exports of 578,200 MT were up 5 percent from the previous week and 30 percent from the prior 4-week average. The market is balancing EU wheat concerns against better than expected production from the US, Russia, Canada and Australia. There will be no shortage of wheat on offer for export in 2016/17, just a few different origins behind the offers. Russia alone look like having the product behind them to be very aggressive throughout the whole the season. Their crop is at 41.9 MMT so far off only 38.4% of the planned area. A Bloomberg survey into trader/analyst sentiment found 9 wheat bulls, 11 bears and 12 neutrals. Japan bought 62,952 MT of US wheat in their part tender. Sep 16 CBOT Wheat settled at $4.03 1/4, down 7 cents; Sep 16 KCBT Wheat settled at $4.05 3/4, down 6 1/2 cents; Dec 16 MGEX Wheat settled at $5.01, down 4 3/4 cents. 04/08/16 -- EU grains finished mostly lower. The pound was little changed despite the Bank of England cutting UK interest rates to a lowest ever 0.25% and signalling that rates could go even lower yet. The day ended with Nov 16 London down GBP0.30/tonne at GBP127.45/tonne, Sep 16 Paris wheat was EUR2.00/tonne lower at EUR166.25/tonne, Aug corn was down EUR0.50/tonne at EUR164.50/tonne and Nov 16 rapeseed was up EUR3.00/tonne to EUR364.25/tonne. 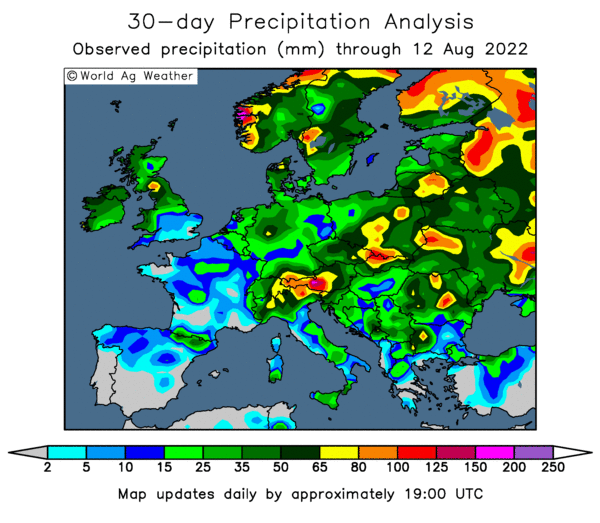 The HGCA suggested that "untiring rains over the past few weeks is expected to have caused further concerns for German wheat." 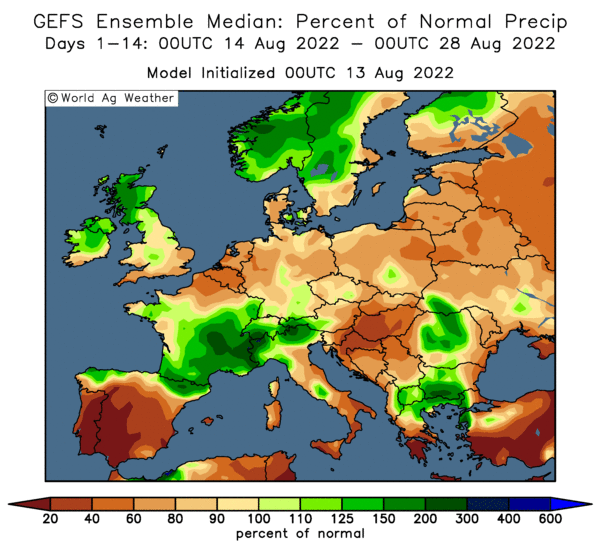 The German wheat harvest is only around a third complete and "due to the delayed and interrupted harvest in some cases, there is a lot of uncertainty now surrounding yields for harvest 2016," they said. The UK wheat harvest is still waiting to get going, early reports back from the field will make for interesting reading and debate. Ukraine seems to be suffering no such problems, although production is estimated lower than last year due to adverse planting conditions last autumn. APK Inform see output in 2016 at 24.1 MMT, down 9% on last year. The early grain harvest in Ukraine has raced to 92% complete at 34.3 MMT off 8.8 million ha. That includes 92% of the planned wheat harvest along with 97% of the anticipate barley area and 91% of the OSR crop. The Ukraine Ministry say that this year's wheat crop is 55:45% in favour of milling wheat compared to only 40:60% last year. The Russian wheat harvest meanwhile is 38.4% done off 10.6 million ha for a crop of 41.9 MMT thus far. 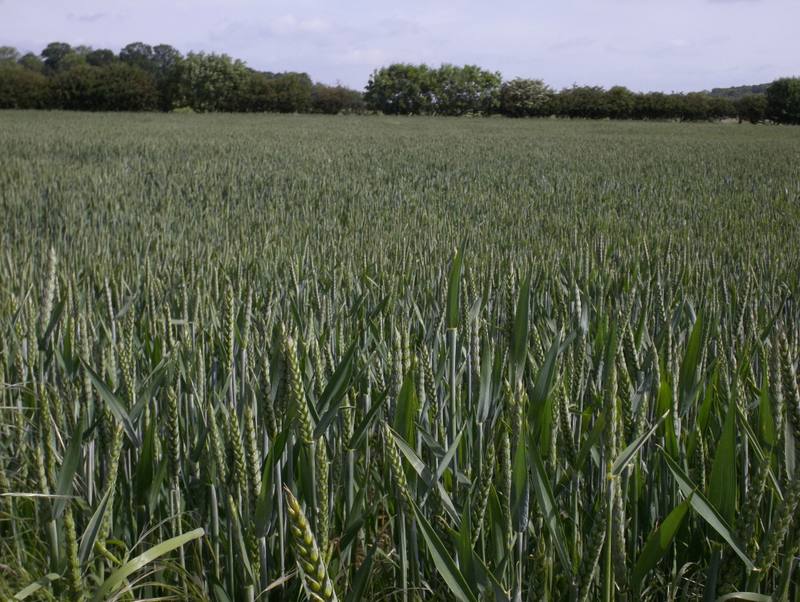 Winter and spring barley is 26.7% cut (2.2 million ha) for a crop of 7.1 MMT to date. 03/08/16 -- Soycomplex: Beans closed modestly higher on strong export interest and bottom-picking. The USDA reported 256,200 MT of soybeans sold for delivery to unknown destinations. Of the total 66,000 MT is for delivery during the 2015/16 marketing year and 190,200 MT is for delivery during the 2016/17 marketing year. In addition they reported sales of 441,000 MT of soybeans for delivery to China during the 2016/17 marketing year. It is interesting to see the US picking up this sort of business as it backs up the argument that South America hasn't got that much left to do. This would mark an unusually early switch in demand to North America and one that demands a record crop to satisfy it. Aug 16 Soybeans settled at $9.90 1/2, up 5 1/4 cents; Nov 16 Soybeans settled at $9.55 1/2, up 2 1/2 cents; Aug 16 Soybean Meal settled at $330.50, up $2.10; Aug 16 Soybean Oil settled at 30.30, up 24 points. Corn: Corn closed with small net gains. Export sales of 290,000 MT of corn for delivery to unknown destinations during the 2016/17 marketing year were reported by the USDA under the daily marketing system. The Energy Dept shows US ethanol production up 6,000 barrels/day to 1,004,000 million barrels/day. Of significant interest is talk of the Brazilian government working on allowing US GMO corn to be imported into the country for feed use. This lends weight to the argument that supplies are tight and that they are a spent force on the export front until next year. Strong production is expected in Europe and the FSU this year. Weakness in their respective domestic currencies should make competing against US corn on the global market relatively easy. Sep 16 Corn settled at $3.25, up 3/4 cent; Dec 16 Corn settled at $3.35, up 1 cent. Wheat: Wheat closed closed higher. Fresh news was limited. Concerns over European production keep getting voiced, but as yet we have no confirmation of the plight afflicting France having spread in a meaningful way to neighbouring countries. Japan bought 55,480 MT of US feed wheat and is in the market for milling wheat in it's usual weekly tender. Egypt said that they now have enough wheat bought to last them until mid-February. The Russian harvest is going well, with 40.5 MMT of wheat produced off only 37% of the planned harvestable area then it is easy to see why some are now calling for a crop in excess of 70 MMT to be produced this year. That excess will make up for most of the French shortfall on it's own. Sep 16 CBOT Wheat settled at $4.10 1/4, up 9 cents; Sep 16 KCBT Wheat settled at $4.12 1/4, up 5 3/4 cents; Dec 16 MGEX Wheat settled at $5.05 3/4, up 5 cents. 03/08/16 -- EU grains closed mostly steadier. Sterling remains nervous ahead of tomorrow's Bank of England announcement on interest rates, and monetary policy due tomorrow. The day ended with benchmark Nov 16 GBP0.50/tonne higher at GBP127.75/tonne. Sep 16 Paris wheat traded down EUR0.25/tonne at EUR168.25/tonne, Aug corn was EUR1.75/tonne lower at EUR168.00/tonne and Nov 16 Paris rapeseed was EUR4.75/tonne firmer at EUR361.25/tonne. Egypt said that they have sufficient wheat bought to cover their needs through to mid-Feb following yesterday's purchase of Russian wheat. Russia said that they will analyse the trade proposal to remove the export duty on wheat. At the same time they sought to defend the tax saying it had worked well since it was introduced and hadn't interferred with trade, Russian exports in 2015/16 were at record levels after all. It already looks like this record will be broken in 2016/17 whether the duty is remains or is removed. The Russian harvest for 2016 stands at 53.9 MMT off only 30.9% of the intended area. That includes 40.5 MMT of wheat off 37% of plan, with yields running at 3.95 MT/ha (3.45 MT/ha in 2015). A record wheat crop in excess of 70 MMT is expected in some quarters and is achievable, it could be more. The Russian barley harvest stands at 6.7 MMT off 25% of plan. In Ukraine, the early harvest is 88% complete at 32.6 MMT. That includes 22.67 MMT of wheat (88% harvested) and 8.83 MMT of barley (92% done). They've also harvested 1.07 MMT of OSR off 90% of planned areas. Jordan are tendering for 100,000 MT of hard wheat for Feb/Mar shipment along with 100,000 MT of feed barley for Jan delivery. 02/08/16 -- Soycomplex: Soybeans closed lower. FCStone released their latest ideas for production and yields this year coming up with a record 4.054 billion bushel crop and average yields at a record 48.8 bu/acre. The USDA currently line up at 3.88 billion bu and 46.7 bu/acre on yields. If FCStone are correct then carryout in 2016/17 could be a lot higher than the currently projected 291 million bu. US weather has adopted a more non-threatening look than it had a week or so ago with decent rains and warm but not exceptionally hot temperatures for much of the Midwest. China bought 252,000 MT of new crop beans as announced under the daily reporting system. Aug 16 Soybeans settled at $9.85 1/4, down 10 3/4 cents; Nov 16 Soybeans settled at $9.53, down 8 1/2 cents; Aug 16 Soybean Meal settled at $328.40, down $5.60; Aug 16 Soybean Oil settled at 30.06, up 31 points. Corn: The corn market closed narrowly mixed. FCStone estimated 2016 US corn yields at 175 bu/acre and production at 15.146 billion bushels, both record levels. The USDA were at 168 bu/acre and 14.54 billion bu last month. New estimates will be released next week. This could potentially put US carryout at the largest levels since 1987, assuming no increase in demand from the UDSA. Current prices are hence flirting with contract lows. "Summer growing conditions in corn have been mostly favourable, though not ideal. Rainfall has been ample, promoting strong growth and development in corn. Periods of heat have been detrimental," said Martell Crop Projections. The satellite view indicates a favourable Midwest corn crop in the making. Robust vegetation is revealed in the July 28th image shaded deep blue and dark green in the Midwest. Kansas and Nebraska vegetation is significantly better than a year ago, shaded deep blue. However, northern Iowa and Minnesota are mostly green, indicating a less robust crop than last year." Sep 16 Corn settled at $3.24 1/4, down 1 1/2 cents; Dec 16 Corn settled at $3.34, down 1/4 cent. Wheat: The wheat market closed mixed, but mostly lower. Egypt bought one cargo of Russian wheat in their tender. No US or French product was offered. The price paid for Russian wheat was around $30/tonne below where US offers would have lined up. The US winter wheat harvest is winding down, with just 11% of that crop left to bring in. Yields are good by US standards. The French crop keeps getting downgraded, but production elsewhere is rising. Rusagrotrans today raised their estimate for the Russian wheat crop to a new record 70-71 MMT, which will keep them competitive on the international front right through the whole 2016/17 season. Australia's crop is also now expected to come in around the 27 MMT mark. 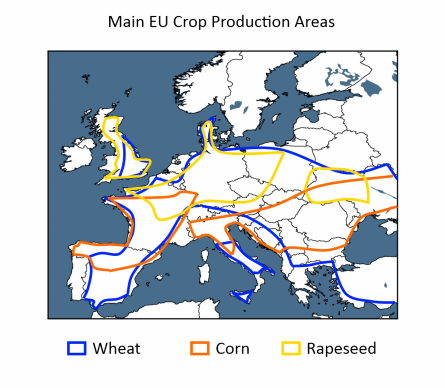 The jury is still out on Europe, mainly due to France, but also there are questions being raised over the UK where the wheat harvest has yet to begin. Early UK barley yields are disappointing. Sep 16 CBOT Wheat settled at $4.01 1/4, down 4 3/4 cents; Sep 16 KCBT Wheat settled at $4.06 1/2, down 2 3/4 cents; Dec 16 MGEX Wheat settled at $5.00 3/4, up 1/2 cent. 02/08/16 -- EU grains closed mixed, wheat was mostly firmer as more crop downgrades continue to come in for France. At the close Nov 16 London wheat was up GBP0.55/tonne at GBP127.25/tonne, Sep 16 Paris wheat was up EUR1.50/tonne to EUR168.50/tonne, Aug Paris corn was up EUR1.00tonne at EUR169.75/tonne and Nov 16 Paris rapeseed was EUR1.75/tonne lower at EUR356.50/tonne. For Nov 16 London wheat this was the highest close for a front month in more than a year. ODA dropped their estimate for this year's French wheat crop to 28.2 MMT, saying that yields in the key Centre/North regions are in some cases less than half of what they were a year ago. The market remains anxious/curious as to what the UK wheat harvest will bring when that commences shortly. French offers were once again missing from today's Egyptian wheat tender. They finished up buying just the one cargo of Russian wheat, after shippers revised their prices higher. At the moment is seems that France is alone suffering wheat losses of the kind of magnitude that are being seen. One or two other European countries are expecting production to be lower, but nothing like the kind of percentages being talked about in France. Elsewhere, harvest estimates are creeping higher. In Russia, Rusagrotrans now say that this year's grain harvest will amount to 115.8 MMT as opposed to the 113 MMT previously forecast. Wheat production will account for a record 70-71 MMT versus the previous estimate of 68.4 MMT, they say. Barley production will come in at 18.3 MMT and the corn crop will amount to 13.8 MMT, they add. The Russian Ag Ministry said that this year's wheat harvest is 38.2% complete at 37.9 MMT, so the bare maths do stack up, even if it is mainly lower yielding spring wheat areas left to be harvested. 01/08/16 -- Soycomplex: Beans closed with some hefty losses. Fund money sits on a sizable shaky long in beans. US weather appears to be largely non-threatening, unless we switch to a too much rain is bad for the crop mood. "Stormy weather continues in the Midwest, the 7-day forecast calling for drenching rain in Iowa, Illinois, eastern Missouri and western Indiana," said Martell Crop Projections. There were some bullish stories around today, but these largely got ignored. The USDA announced 391,000 MT of soybeans sold for delivery to unknown destinations during the 2016/17 marketing year under the daily reporting system. There are reports of China cancelling 2 cargoes of Brazilian beans due to contamination with "red dioxin" beans. Could this mark a switch to US origin material? 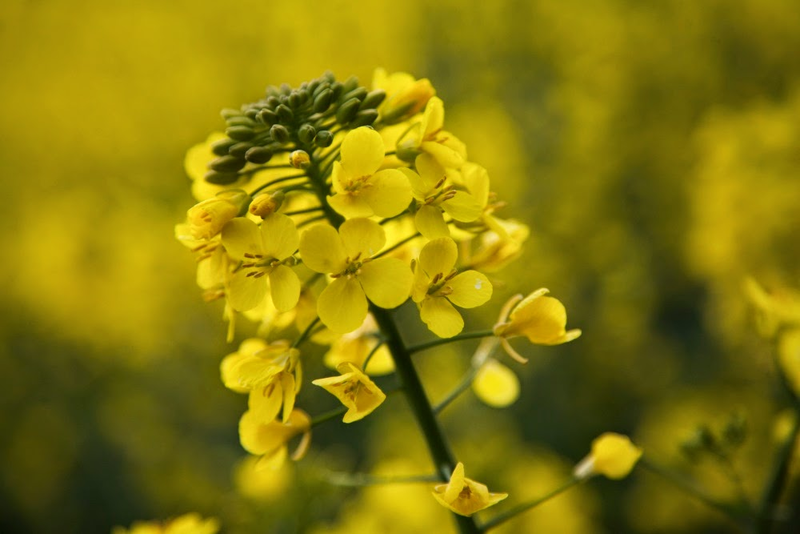 Strategie Grains downgraded the EU-28 OSR crop by more than half a million tonnes. 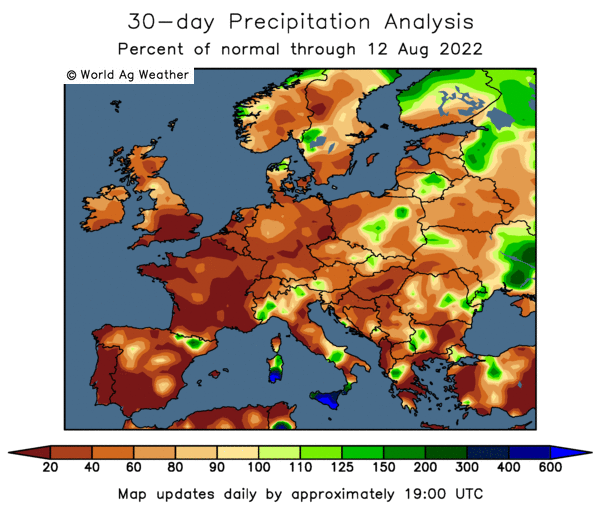 Excess rains in France cut their crop by 410 TMT from last month to 4.7 MMT. After the close the USDA raised US crop conditions one point to 72% good to excellent. They said that 54% of the crop is setting pods (44% typically at this time) and the crop is 85% blooming (79% on average). Weekly export inspections were impressive at 671,154 MT. Aug 16 Soybeans settled at $9.96, down 36 1/2 cents; Nov 16 Soybeans settled at $9.61 1/2, down 41 1/2 cents; Aug 16 Soybean Meal settled at $334.00, down $16.00; Aug 16 Soybean Oil settled at 29.75, down 60 points. Corn: The market closed around 8 cents lower. August weather has adopted a more benign look to it, and the worst month for corn yields is July, so the market is thinking that another big US corn crop is now entering the home straight. "The drenching rain in July has coincided with the pollination period in corn, boosting the yield potential," said Martell Crop Projections. Weekly export inspections were respectable at 1.144 MMT. Talk continues that safrinha corn supplies in Brazil are tight and that the US can win a larger share of the global export market than has been the recent norm across these next few months. The USDA reported unchanged US corn good to excellent ratings after the close at 76%. They said that 91% of the crop is silking as opposed to 85% typically at this time, and that 30% is at the "dough" stage (25% on average at this time). Ukraine's seaports exported 625.6 TMT of grains last week of which 48.7 TMT was corn. Russia said that of it's accumulated Jul 1-27 grain exports of 1.72 MMT only 18.3 TMT was corn. Sep 16 Corn settled at $3.25 3/4, down 8 3/4 cents; Dec 16 Corn settled at $3.34 1/4, down 8 1/2 cents. Wheat: The wheat market ended a wee bit lower. Weekly export inspections of 662,373 MT were up 12.7% from last week and more than twice as much as the weekly total from a year earlier. France is reported to have bought Romanian wheat and possibly Russian material as well to make up a shortfall in this year's domestic crop. ODA put that (soft wheat only) at 28.2 MMT today versus almost 41 MMT a year ago. There are few problems elsewhere though. NAB see the Australian wheat crop at 27.2 MMT versus 26.1 MMT previously. Russia say that they are 38.2% of the way through a wheat harvest that has produced 37.9 MMT so far. Grain exports so far (Jul 1-27) are up 7.4% at 1.72 MMT, of which 73% (1.25 MMT) is wheat. Ukraine's wheat harvest is said to be 84% complete at 21.5 MMT. Ukraine's grain exports via seaports last week were 625.6 TMT of which 358.9 TMT was wheat. The USDA said that the US winter wheat harvest is 89% complete (86% normally). Spring wheat is 10% harvested (9% on average). Spring wheat crop conditions were unchanged on a week ago at 68% good to excellent. Sep 16 CBOT Wheat settled at $4.06, down 1 3/4 cents; Sep 16 KCBT Wheat settled at $4.09 1/4, down 1/2 cent; Dec 16 MGEX Wheat settled at $5.00 1/4, down 3 1/2 cents. EU Grains Mixed, France Buying In Wheat? 01/08/16 -- EU grains finished mixed, with rapeseed following sharply lower Chicago soybean into the red, but London wheat getting support from a weaker sterling. The day ended with Nov 16 London up GBP1.00/tonne at GBP126.50/tonne, Sep 16 Paris wheat was EUR1.00/tonne higher at EUR167.00/tonne, Aug corn was down unchanged at EUR168.75/tonne and Nov 16 rapeseed was down EUR3.75/tonne to EUR358.25/tonne. The pound is under a bit of pressure on the belief that the Bank of England will cut UK base rates to a 300-year low 0.25% on Thursday. 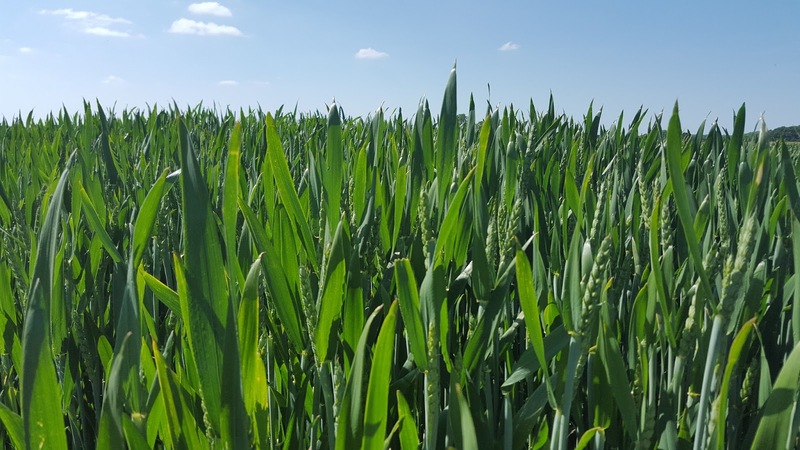 Concerns over French crops abound, Strategie Grains today cut their view on the French OSR crop by 410,000 MT to 4.7 MMT, a 12% decline on a year ago. The also reduced Germany (down 160,000 MT to 5.0 MMT) and Poland (down 230,000 MT to 2.2 MMT). The overall view on the EU-28 was down 570,000 MT on last month to 20.7 MMT, a 5.5% fall compared with last year. ODA forecast the French soft wheat crop at 28.2 MMT, Reuters confirmed reports of France buying Romanian milling wheat for August shipment to Dunkirk. There are also rumours of a French co-op booking Russian 12.5% milling wheat into Rouen. Elsewhere though the harvest continues as normal. Russia is 27.6% done on 13 million ha with 49 MMT in the bin so far. That includes 37.9 MMT of wheat and 5.7 MMT of barley. Russian exports for Jul 1-27 stand at 1.72 MMT, a 7.4% rise on a year ago. Of that total 1.25 MMT is wheat. Ukraine's early grain harvest is 84% complete on 8.1 million ha for a crop of 31 MMT to date. That includes 21.5 MMT of wheat and 8.5 MMT of barley. They've also harvested 1.1 MMT of OSR off 88% of plan. National Australia Bank forecast the 2016 wheat crop there at 27.2 MMT versus 26.1 MMT previously - the 3rd largest on record. 29/07/16 -- Soycomplex: Beans closed sharply higher. 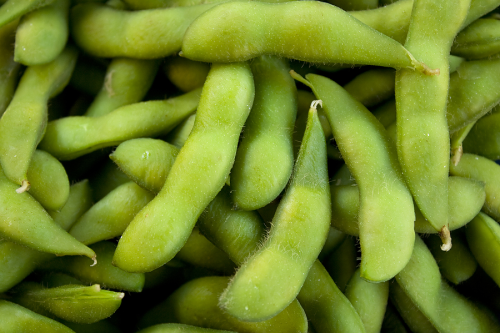 The USDA reported export sales of 129,000 MT of soybeans for delivery to unknown destinations. Of the total 66,000 MT is for delivery during the 2015/2016 marketing year and 63,000 MT is for delivery during the 2016/2017 marketing year. Unlike others who foresee a drop, the IGC said that China would raise soybean imports in 2016/17 to 88 MMT. They were unchanged in Argentine and Brazilian new crop production (55 MMT and 101 MMT respectively), but upped the US from 103.5 MMT to 105 MMT. Overall they see world 2016/17 production rising 1 MMT from last month to 321 MMT, but increased consumption 3 MMT to 327 MMT. Mid-day weather runs were supportive coming in slightly drier and hotter than the overnight runs. Aug 16 Soybeans settled at $10.32 1/2, up 29 cents; Nov 16 Soybeans settled at $10.03, up 25 cents; Aug 16 Soybean Meal settled at $350.00, up $8.50; Aug 16 Soybean Oil settled at 30.35, up 86 points. Corn: Corn closed 3-4 cents higher on spillover support from beans. There was probably some end of month short-covering and a bit of spec buying as the latest weather forecasts turned a bit hotter and drier. Heat should now start to become less of a factor for US corn as we get into August. Decent export demand and a lack of cheap offers out of South America are the best story that the bulls have for US corn right now. The upcoming FSU harvest is not so bullish though. The IGC raise their view on world corn production in 2016/17 by 14 MMT to 1017 MMT, consumption was increased 8 MMT to 1010 MMT. The Argentine crop was raised to 39.2 MMT, Ukraine's upped from 25.5 MMT to 26.5 MMT and the US crop from 355.3 MMT to 365.2 MMT. The Buenos Aires Grain Exchange said that the Argentine crop was 58.6% harvested versus 79% this time last year. Production so far is at 17.2 MMT and yields are 8.44 MT/ha. FranceAgriMer left their corn good to very good crop ratings unchanged at 69%. They said that 46% of the crop was silking as opposed to 90% a year ago. Sep 16 Corn settled at $3.34 1/2, up 3 1/4 cents;Dec 16 Corn settled at $3.42 3/4, up 4 cents. Wheat: Wheat closed mixed. 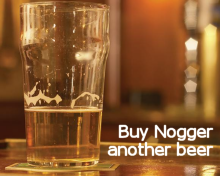 The market remains torn between the ongoing disaster that is France and good crops elsewhere. The worst of the news for France might not all be in the market yet, the harvest is less than 50% done according to FranceAgriMer. Crop conditions were down again this week, by 2 points to 42% good to very good. EU soft wheat export licences outstrip year ago levels by 37.5% so far. French offers might be missing from GASC's tenders but Romania is in there pitching. The IGC raised their estimate for the global 2016/17 wheat crop by 6 MMT from last month to 735 MMT. Consumption was increased 7 MMT to 727 MMT. The EU crop was cut from 154.6 MMT to 149.0 MMT. Australian production was up from 25.5 MMT to 26.0 MMT, Russia was raised from 63.0 MMT to 67.5 MMT, Ukraine increased from 23 to 25 MMT and the US up from 56.6 MMT to 61.5 MMT. The Buenos Aires Grain Exchange said that the Argentine wheat crop was 88% planted, with the area this year expected to be 4.3 million ha, up 19.4% on last year. Even so, most of this extra surplus will likely go to Brazil. Sep 16 CBOT Wheat settled at $4.07 3/4, down 2 1/2 cents; Sep 16 KCBT Wheat settled at $4.09 3/4, up 3/4 cent; Dec 16 MGEX Wheat settled at $5.03 3/4, up 2 cents.